Ever since Hiram Bingham brought the famous Inca citadel of Machu Picchu to the world’s attention in 1911, growing numbers of tourists have visited Peru each year. But few visitors venture to the north coast where other spectacular archaeological sites await along with large expanses of sandy beach, world-renowned surf, and excellent seafood. 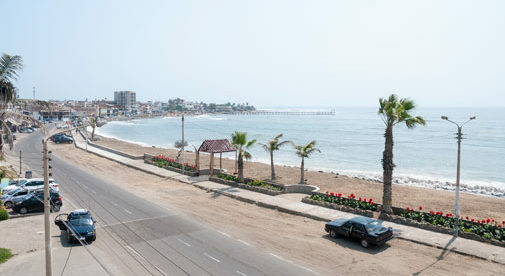 The small fishing/surfing town of Huanchaco is located 300 miles north of Lima. Only minutes away from the bustling city of Trujillo, the third largest in the country, it boasts an inexpensive cost of living and laid-back lifestyle. Huanchaco is worth a look as a retirement location for those seeking a tranquil beach town. For most of the year, temperatures hover around the low to mid 70s and rainfall is pretty much non-existent. Springtime starts in early September, but the winter months (June—August) can sometimes feel like a chilly U.S. autumn and temperatures can dip into the mid 60s. But even during these cooler months, you will still get two or three days of warm sunshine every week. During the peak summer months of January and February, Huanchaco swells in size as the tourist population increases. For the rest of the year, except on busy weekends and national holidays, it may be too sleepy for some. However, with the airport located only ten minutes from the beach, you can be exploring other popular locations such as Cusco, Lima, or Arequipa in a couple of hours. In this short video Steve LePoidevin, IL’s Peru correspondent, takes a brief look at life in this small coastal town.